Almost any stereo system can be made to sound better with the proper set up. Since there is plenty of information available on basic set up I won’t spend a lot of time there, but I will offer some simple and inexpensive tweaks to improve the sound quality of your playback system. Placement of your components is very important to good playback. If you have separates (preamp, amp, turntable, CD player, etc.) stacking is not a good idea. Each component has an electromagnetic field, which produces noise that can be picked up by the amplification stages of your electronics. Separating them reduces noise and also allows for proper ventilation. 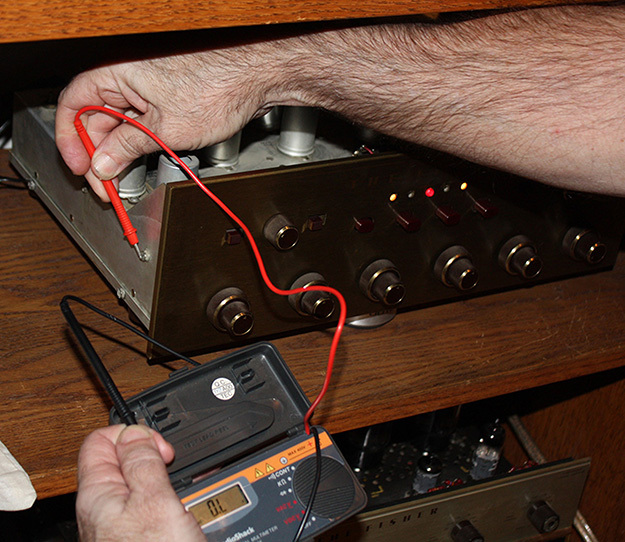 Your turntable should be on a solid foundation to minimize vibration as much as possible because those vibrations can be picked up by the sensitive phono cartridge “smearing” the sound and making it less detailed and focused. Also it’s important to keep the speakers away from the turntable for similar reasons. The bass notes in particular can cause the needle to jump during playback. There is plenty more you can accomplish in set-up and placement that I will cover in future issues. The correct orientation of the plug will improve imaging (focus), tighten bass and present an ideal soundstage for the recording. The best way to do this is with a multi-meter (voltage meter). If your stereo equipment was made within the last 20 years it probably has a power cord with a 3-prong “grounded” plug. Unfortunately that ground prong really hurts the sound quality. Without getting technical I’ll offer a simple and reversible fix or tweak. For each of your components, buy one of those 3-prong to 2-prong adaptors or “cheater” plugs. The one you want is usually gray and made of solid hard rubber not the hollow plastic one. Starting with your preamp (or receiver if you don‘t have separates), plug the power cord into the cheater plug and then into the wall outlet. Use the same orientation as if the ground prong were being used. You should hear more dynamics and “air” around the music. It should sound less constrained. It is usually dramatic and easy to hear. Repeat with every component and your sound will have greater energy, dynamics and musicality (involvement). Should you get a low level hum, you only need to ground one component in the system to close the possible “ground loop” and it should go away maintaining most of the improvement. The last thing to do regarding the power cord involves AC plug polarity. Now that you have eliminated the ground prong, the orientation of the plug in the right direction for correct polarity will improve imaging (focus), tighten bass and present a correct soundstage for the recording. The best way to do this is with a multi-meter (voltage meter). Set to “AC.” Power the component on with the interconnects disconnected from the rest of system. Hold the black lead between your fingers and then touch the red lead to a screw in the chassis of the component. Note the voltage and then flip the AC plug in the outlet and again touching the red lead to the chassis; observe the meter. The lower number is correct. Repeat for all components. You can of course do it by ear but I have found this method is always correct. The sonic improvement has been obvious in every system I’ve done this with and this is a reversible and a mostly-free tweak that you can implement easily. Keep an eye out for future advice on audio set up. I received a pair audiophile 12AX7 tube equivalents from “Overlord” that are low noise, long lasting and non-microphonic. Made from modified 1960s’ NOS tube stock, they come with a metallic label that doubles as an RF shield and some sort of metallic top I assume is for the same purpose. The Overlords do not run hot at all which may account for their long life (rated 10,000 hours). I decided to try them in the phono stage of my vintage McIntosh C20 preamp, as that would be the most revealing. After about a 10 hour warm up I listened to a couple LPs I’m very familiar with and often use for system set up (Sergio Mendez Stillness & Art Pepper Plus Eleven). Stillness is useful both for the excellent vocal tracks and the variety of percussion. The first thing I noticed was the quiet noise floor. At first I was worried that the tubes had rolled off the high frequencies but as soon as the music started it was obvious that was not the case. The vocal had all of the air and detail I was used to hearing and the cymbals plenty of shimmer and attack. What I was hearing more of was body or fullness to the overall presentation. The timber and tonality were correct. On Plus Eleven I listen for the attack or “punch” of the big band, which was maintained. I also listened for the “bite” of Art Pepper’s alto, which, if smoothed out would ruin the realness of this amazing recording. It was still there. Most important is it has to “swing” and it did in spades. The sound was very involving with both LPs. I think if your system is on the lean side or a bit hard sounding, these tubes would help without being too smooth. If using vintage gear, they seem to tame some of the noise from RF or transformer. Overall I found these tubes to be very detailed yet with very low noise floor. The retail price is a bit high at $149 each but in today’s world of $5,000 power cords, worth a try. Bob Donnelly is owner of The Analog Shoppe selling vintage vinyl and fine audio. He also is a consultant and head of domestic sales for Impex Records an audiophile reissue company. The Overlord 12AX7 is not a 12AX7 at all, but a Raytheon 5755 on an adapter base, tubes can be had for cheap, and the adapters are a few bucks. If you like the cute hat that’s up to you, not really worth another $170 on a pair. 5755 isn’t a very good sub for 12AX7, due to low transconductance and high plate resistance will not have good drive. This seller ‘old_guy_radiola’ is a notorious scammer and relabler on ebay, check around the forums. Not to be confused with the real RadiolaGuy.com who is a great dude.